We all get hurt, some or the other way in life. It may be by someone we love or by someone whom we not like much. Once we get hurt, we reply back to that person instantly or many be when correct time comes. Till that correct time comes (or may be after that as well) we carry grudges and anger within our self for that person or for that incidence. Sometimes grudges are so deep, we can't let go of it. Unintentionally, we carry burden of hurt, grudges, anger, bitterness in our mind. Eventually, we end up carrying that person, in our mind for so long, and that too on cost of our peace of mind. If we continue doing that for so long, our mind get filled with negative thoughts and anger for that person. Sometimes, we become sad and depress. Moreover to it, our negative energy affect people around us and our surroundings as well, since we usually end up talking about it to every one we meet. We loose our capability to see good in any thing or in any situation. We loose our peace of mind. We all have experienced this, haven't we ? Instead of playing victim, we can choose to take control over anger and grudges by FORGIVENESS and then MOVE ON. 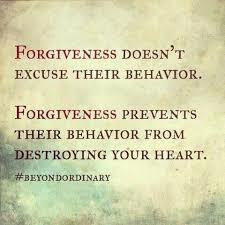 Forgiveness is way beyond a verbal apology. In order to forgive, you must let go of your anger, and negative thought and forgive person deep within yourself. You can even do this without an true apology from that person (if person think he/she is not wrong), and free yourself. If you truly able to forgive, you will stop thinking on that incidence or that person. You can see new possibilities around you, since your mind is not busy or occupied on negative thoughts of that incidence. Since, now you are not stuck on that bad incidence, you are not angry, depressed, or sad any more. You will feel free/light. You will realized that you have managed to throw away unnecessary burden of anger, grudges. Now, your mind is having positive thought. 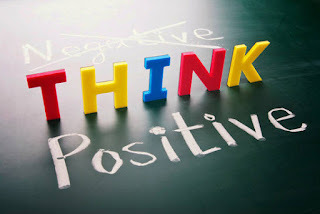 (Click here to see article on How to Think Positive) So you can take the bad incidence on positive note, and learn lesson from it. And you have one more addition to your experiences.That shows mature behavior, and moving on in true scene. True forgiveness is when you can say "Thank You for that experience"
If you can not FORGIVE then FORGET, like it never happened. But of course take lesson from it for future. Do not have any grudges or anger towards that person after you forget. Trust on KARMA. It is more powerful than we think. It does justice with every one, sooner or later. Don't spoil your present with grudges and anger. Change your focus to other things or on other problems, this will help you forget incidence easily. 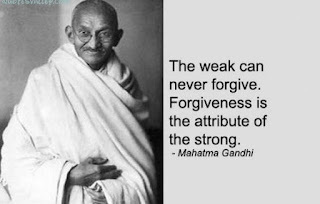 On one of such life incidence, I used to struggle a lot to FORGIVE. I used to think "I can't forgive the person." Because I really got hurt a lot. My grudges was creating trouble for me in my life. My life was getting disturb. Somehow, I got chance to focus on something else, which in turn made me forget that incidence completely. Slowly, I got very busy in my new task that, I had no time to think of that incidence or that person. 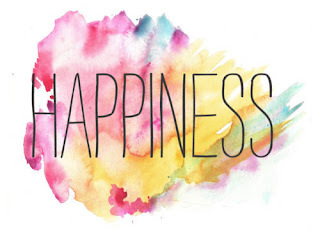 After few days I have realized that such person or things doesn't matter for me. 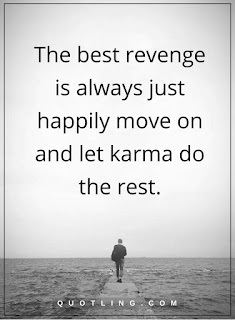 I could manage to overcome grudges, anger and bitterness so easily. I have realized that, if we change our focus from the incidence, then we can FORGET it easily. As time passes, our grudges and anger reduce. We realize that the person or incidence do not deserve our time and attention. Only forgiveness can give us peace of mind. You must be thinking that, I must have forgiven every one who has wronged me or hurt me. No... That's not true. I am not saying that, I always manage to forgive others who hurt me. I am not saying that, you should always forgive the person who have wronged you or hurt you. Sometimes giving back is also important to let the person know that you have knowledge about his/her intentions. After all we all are human, and it hurts when someone wronged us or hurt us again and again. But we should be able to identified those incidence that really really demand our attention to give back to that person. Sometimes silence become your true reply, and will not make you regret what you said. Which will give you peace of mind and slowly make the person realize his/her mistake. Sometimes situations become like that as well, we can't do any thing to change others behavior that hurt us often. In such case, we should chose to forget and move on, for peace of our mind. Don't judge forgiveness with once weakness. No.. Never.... Person who can forgive is of big heart. The person have very deep understanding and maturity to move on. By forgiving, one is not showing that he/she is weak person, but one is showing his/her deep maturity to handle the situation and might be saving on his/her relations as well. Person who forgive knows that his/her peace of mind is much more important that anything else in life. 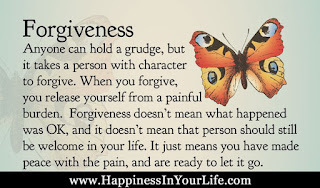 Try to chose FORGIVENESS over grudges, anger, hurt and bitterness. If can't FORGIVE then try to FORGET and occupies yourself in something more important and leave it to KARMA. Slowly you will learn that Forgiveness is only way to your peace of mind. Forgive and Gift yourself peace you deserve !! !